Fender introduces its first ever multi-effects unit in the form of the Mustang Floor-a versatile high-performance floor unit that delivers pro-level amp modeling, effects and artist preset sounds in a richly varied wealth of musical styles. And you don’t have to be a tech expert to use the Mustang Floor-it’s easy to use right out of the box. A natural offshoot of our Mustang series amplifiers (basically a Mustang amp without the power amp and speaker), the Mustang Floor is designed for a variety of applications, only one of which is a great multi-effects unit for any basic guitar amp that puts more than three dozen digital effects at your feet. 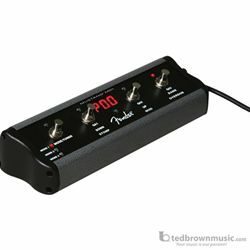 It’s also a modeling preamp with low-impedance speaker-emulated outputs for running direct to a PA system, a modeling preamp with line-level outputs for use with a power amp and speakers, a silent practice system with stereo headphone output and auxiliary input perfect for playing along with an iPod or other media player, and a fantastic tone machine for direct-to-digital USB recording.